□ The tornado that left a streak of devastation through Tuscaloosa and the suburbs of Birmingham during the 2011 Super Outbreak has become one of the most well-known tornadoes in history. It became, at the time, the costliest single tornado on record, and easily the most photographed tornado to date. 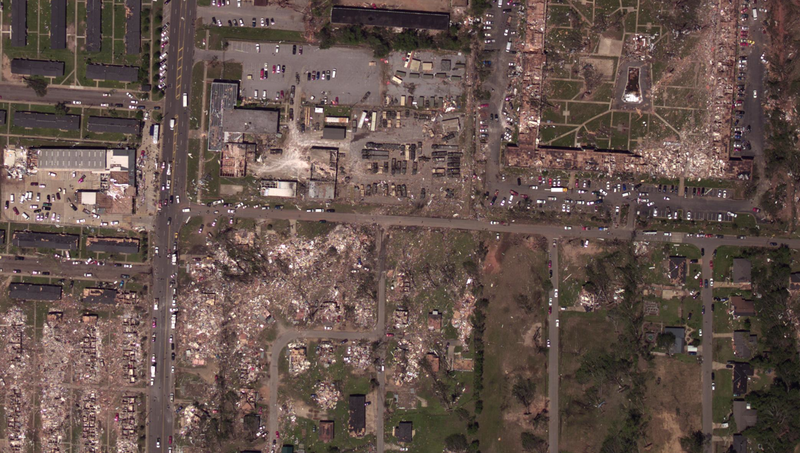 The National Weather Service took particular care in selecting a rating for the Tuscaloosa tornado. There was tremendous public pressure for an EF5 rating, and surveyors spent more than a week analyzing and reanalyzing the damage path. 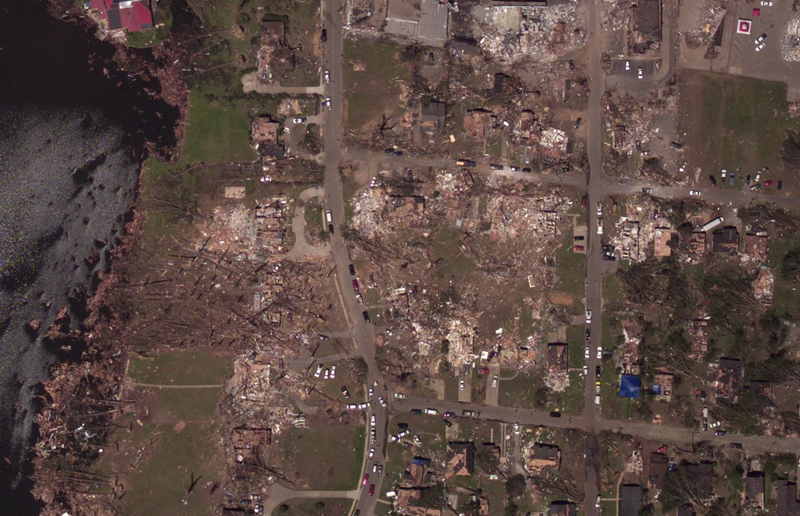 The area of particular interest was the Tuscaloosa suburb of Alberta City, where the most intense damage occurred. There was much disagreement, and one survey team awarded the damage an EF5 rating, but the NWS eventually classified the tornado as a “high-end” EF4. Many people were surprised at the decision. The tornado most certainly would have received an F5 rating on the old Fujita Scale, but the new Enhanced Fujita scale has different and somewhat more stringent rating standards. It is important to note the differences between the Fujita Scale and the Enhanced Fujita Scale, as the Tuscaloosa tornado likely lies squarely in between the two categories. 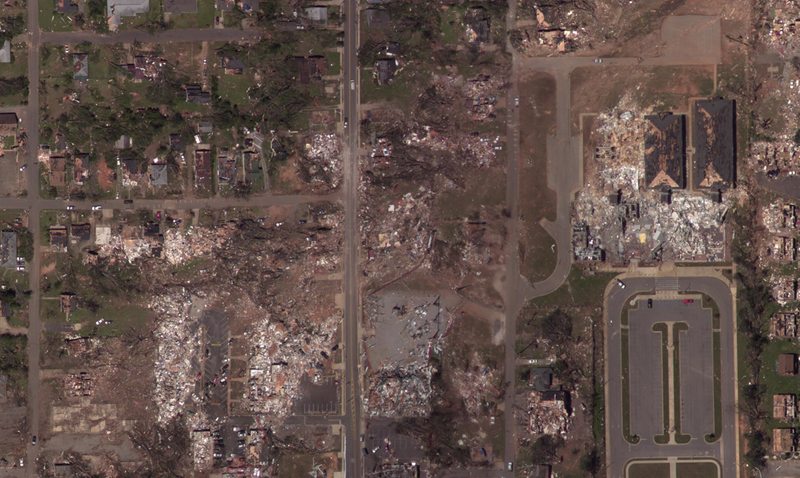 Below are aerial damage photographs that follow the tornado’s path of destruction from Tuscaloosa to suburban Birmingham. Particular attention is paid to areas where EF5 damage may have occurred. As the tornado entered the heavily urbanized southwest side of Tuscaloosa, it devastated two large apartment complexes and caused seven fatalities. A dozen buildings were leveled at the Rosedale Community (bottom left), and a section of the Charleston Square Apartments (top right) was flattened, hurling two college students to their deaths. Perhaps the most impressive footage of the tornado was captured by Ever Duarte from an apartment immediately out-of-frame at top center. A high concentration of fatalities occurred in the Cedar Crest neighborhood, where large, well-built homes were completely flattened. 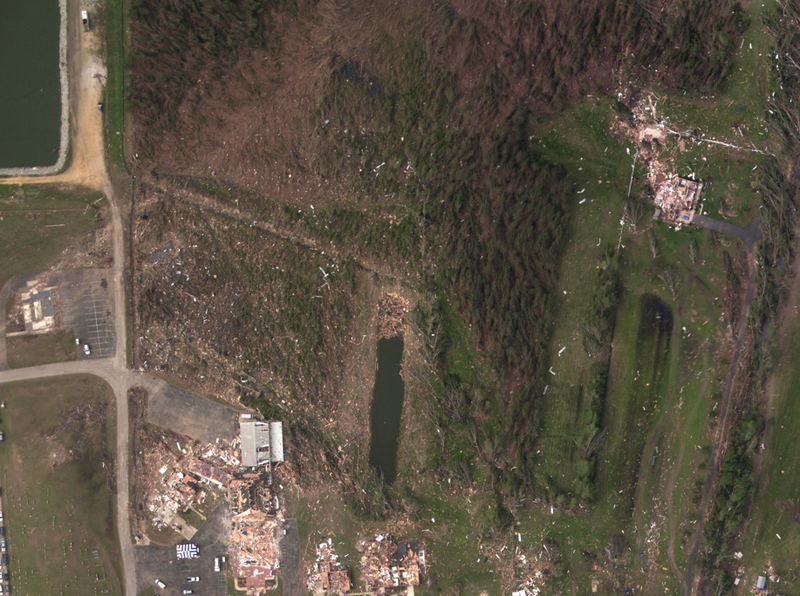 Forest Lake (visible to the left) may have provided the tornado a brief respite from ground friction. Hurricane force inflow winds shattered windows and uprooted trees four blocks away from the EF4 damage swath. The storm’s massive appearance on video was largely due to the low cloud bases typical of supercells in the Deep South. 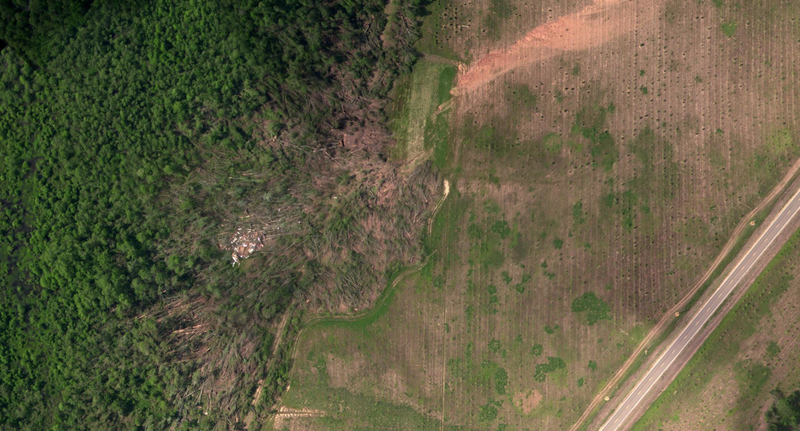 Compared to most violent tornadoes on April 27th, the tornado was quite narrow as it passed through Tuscaloosa – all of the worst damage was confined within a 150-yard wide streak. After exiting town, the tornado widened considerably. 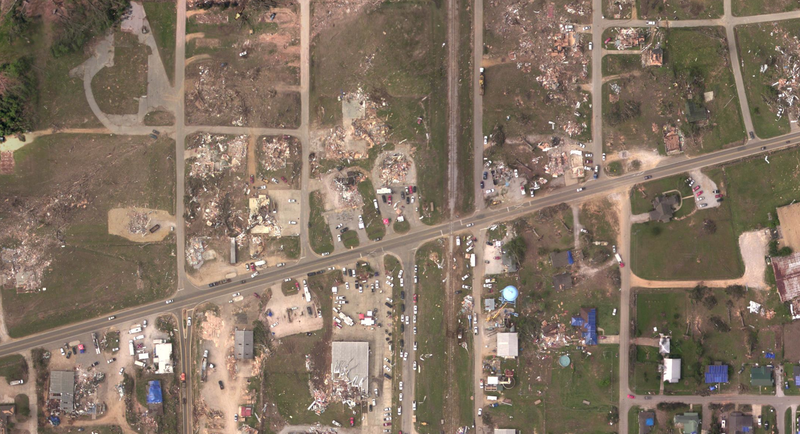 The tornado strengthened as it crossed University Boulevard into the suburb of Alberta City. 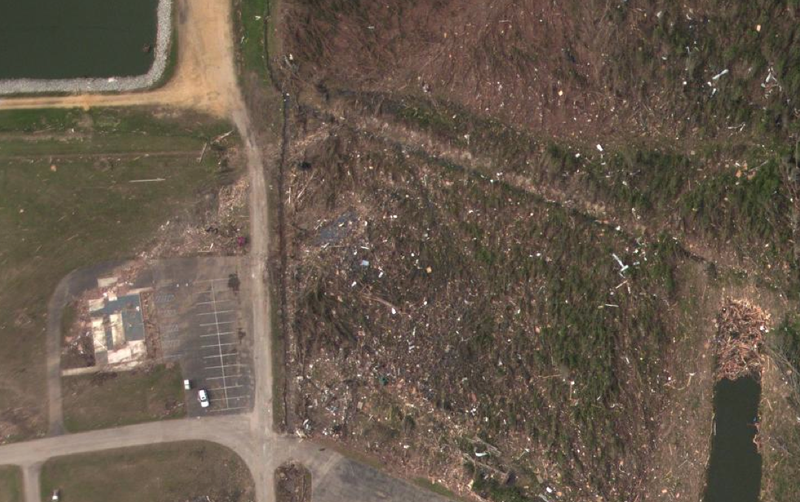 An apartment complex was completely leveled and a large food store (lower right) was swept completely away. There were multiple fatalities in a home just north of the store. 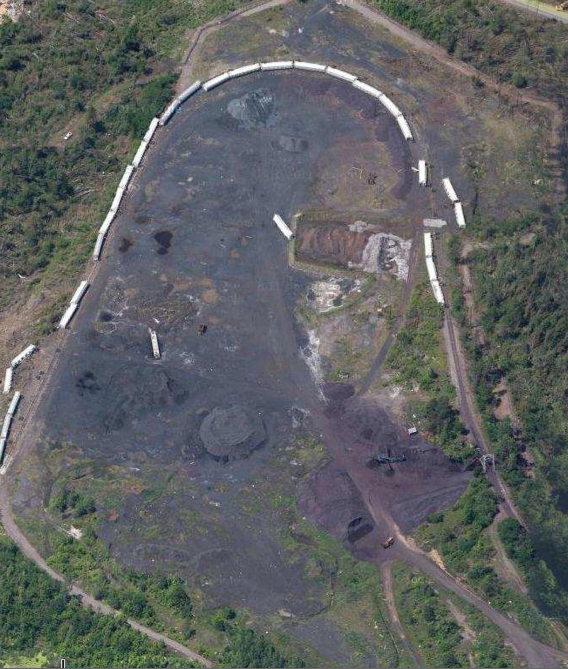 Damage in this area was extreme, and an F5 rating on the Fujita Scale was likely appropriate. 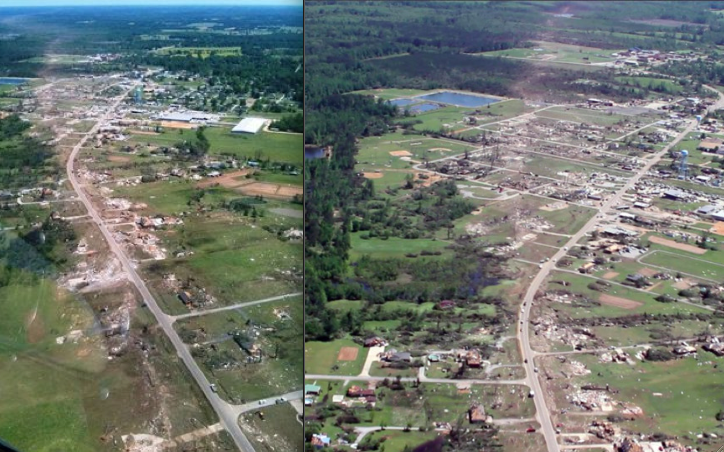 On the Enhanced Fujita Scale, damage in this area was borderline (but not clearly) EF5 in intensity. Wider view of the damage around 25th Street. Large, multi-story buildings were obliterated and grass was partially scoured from the ground. 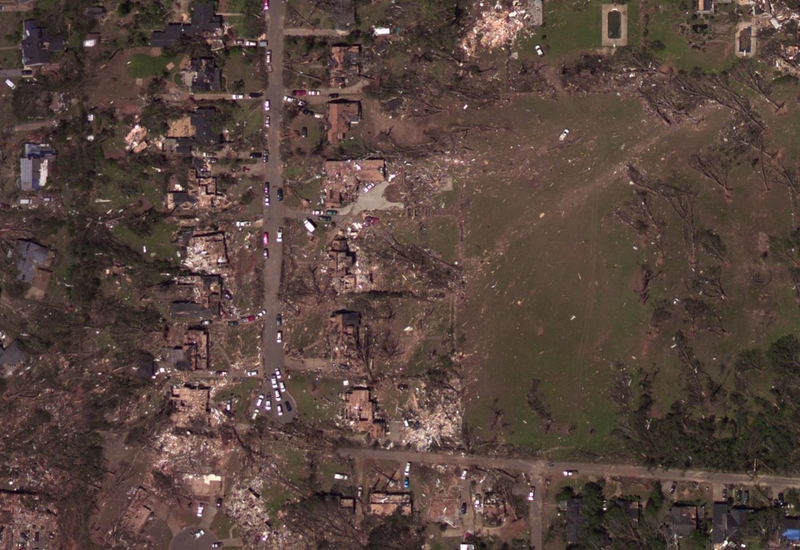 The Tuscaloosa tornado was very fast moving and caused most of its damage in less than five seconds. 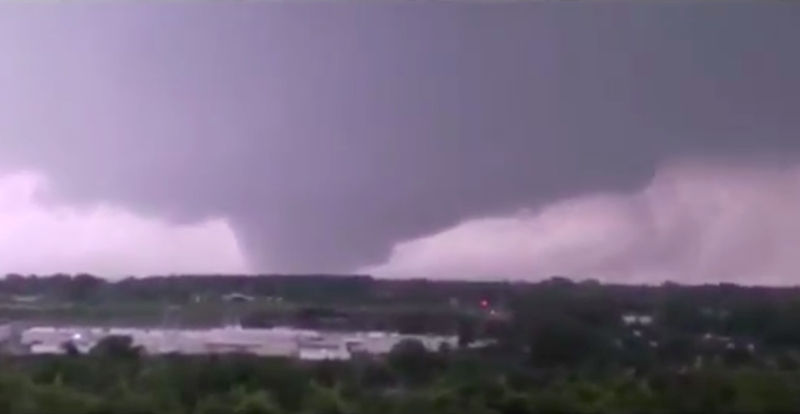 Video of the tornado from 2406 University Boulevard. 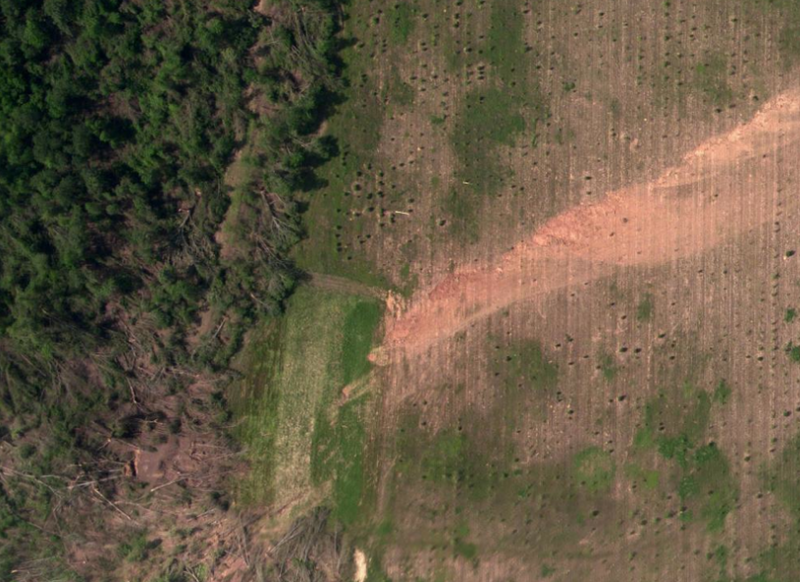 The swath of possible EF5 damage passed less than a block east of this location. The tornado was near peak intensity as it passed over the Chastain Manor Apartments, where two residents died. 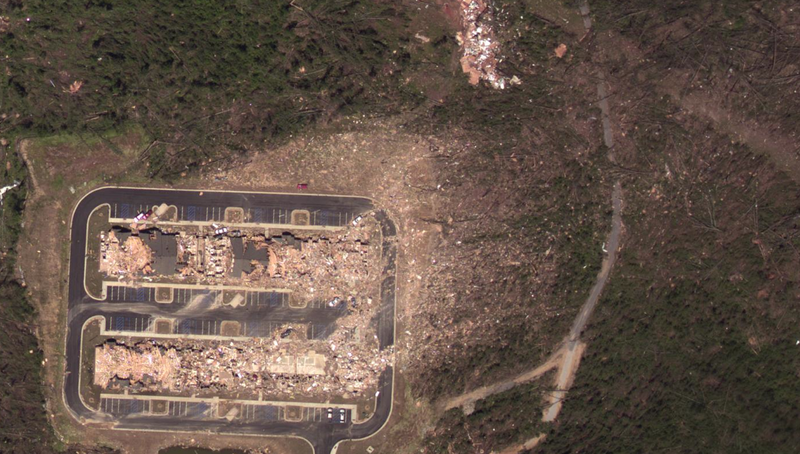 A survey team headed by the National Science Foundation considered the damage to the newly built apartment complex to be of EF5 intensity (LaDue, Marshall, 2011). 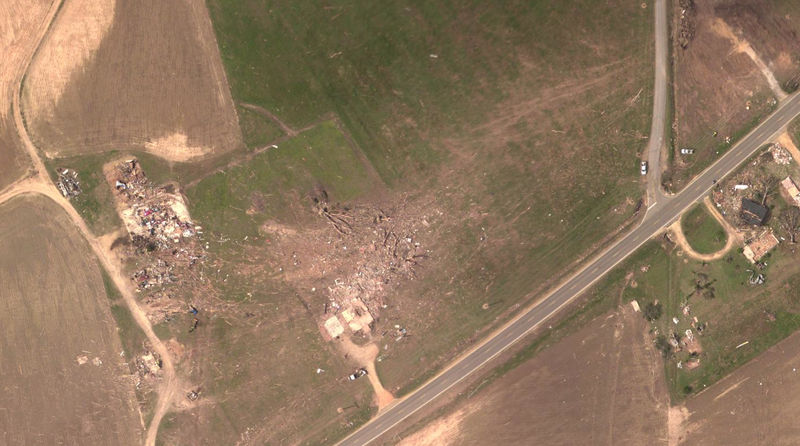 Two additional survey teams, however, considered it to be “high-end” EF4 damage. The southern building’s second floor, which was at ground level on the uphill side of the complex, was swept cleanly away to its cement floor. The structural anchorage was to code, but not considered “superior” in quality. 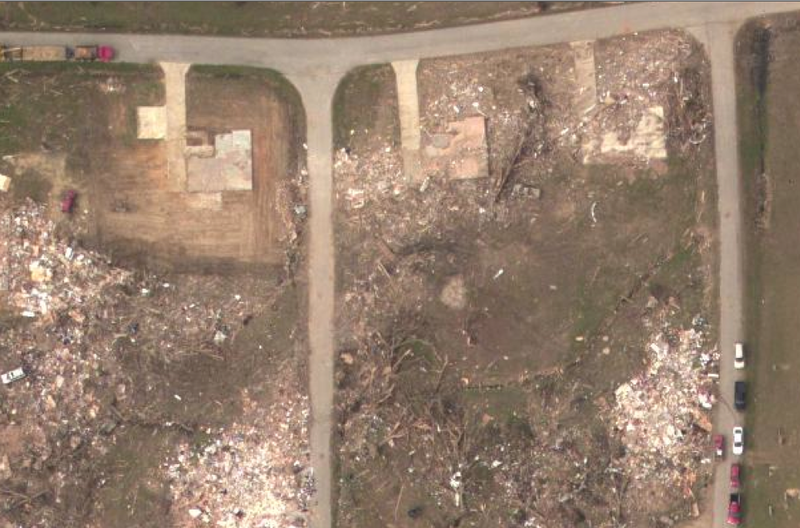 Close aerial view of possible EF5 damage to the Chastain Manor Apartments. 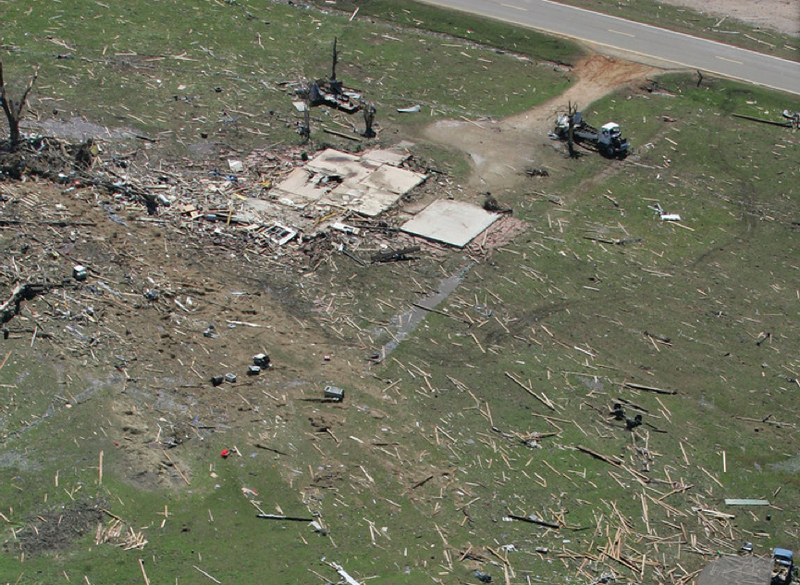 A small but well-constructed club house, just out of frame at bottom, was also swept completely away. Grass around the complex was damaged, but not completely scoured. Considering the speed and size of the tornado, the damage to the apartments likely occurred in only a few moments by instantaneous gusts in excess of 200mph. 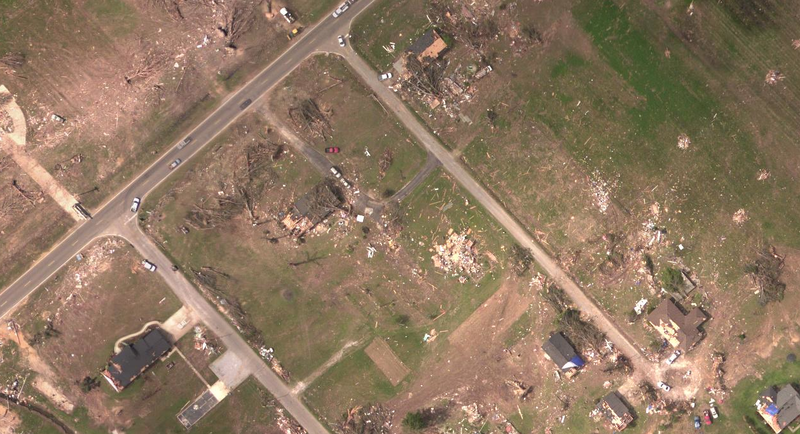 After devastating the Chastain Manor Apartments, the tornado tore through a neighborhood along County Road 45. There were multiple fatalities on Crescent Lane as homes were swept from their foundations. Boats from a business along Keene Street were turned into large projectiles as the tornado struck homes on 5th Street NE. 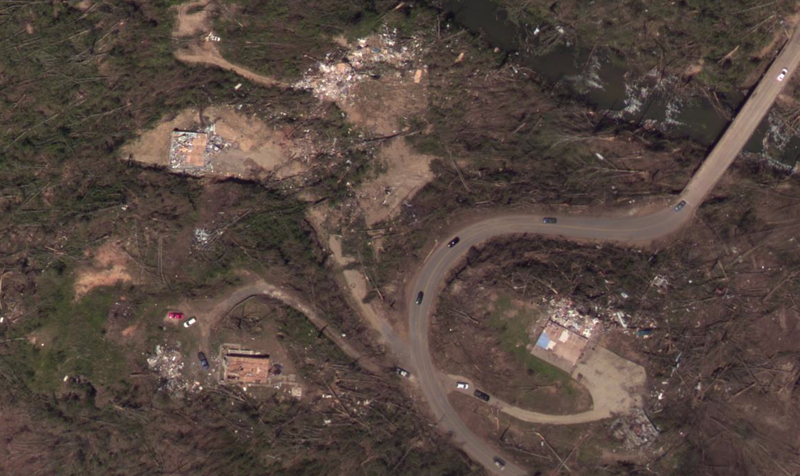 Two homes at bottom center appear to have been swept completely away. 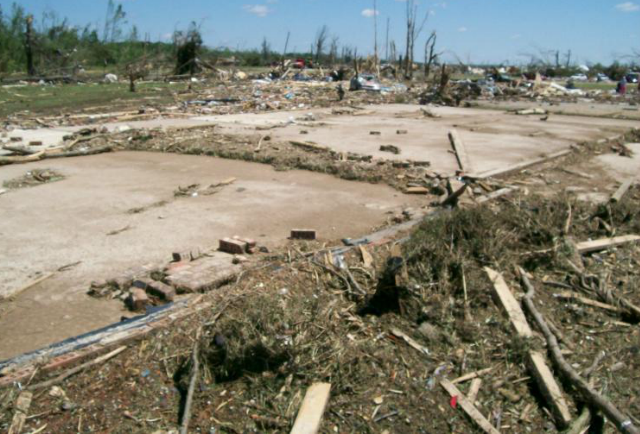 The Enhanced Fujita Scale requires that a home of “superior construction” be swept cleanly away for an EF5 rating to be applied. 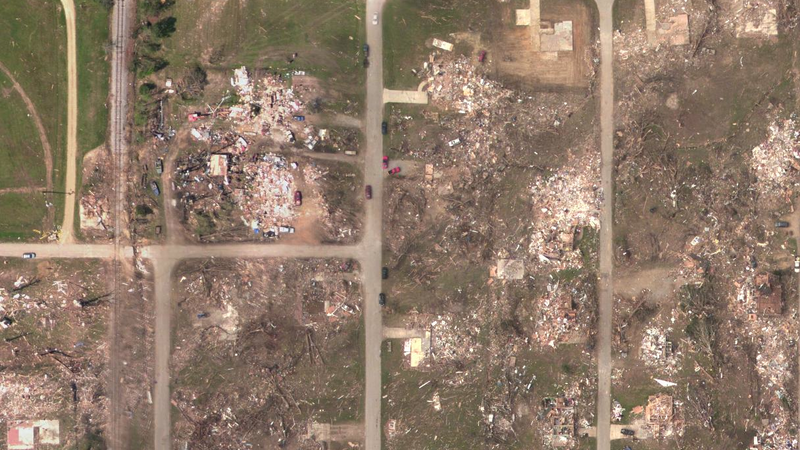 The homes in this area are typical of most frame homes and therefore not adequate to gauge EF5 intensity. 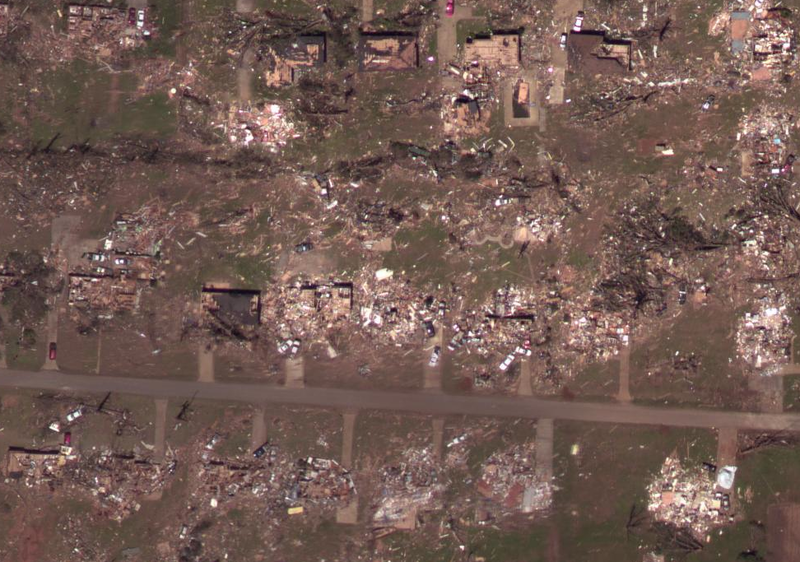 The tornado was expanding as it passed through this area and the core of intense damage widened to over a quarter mile in width. 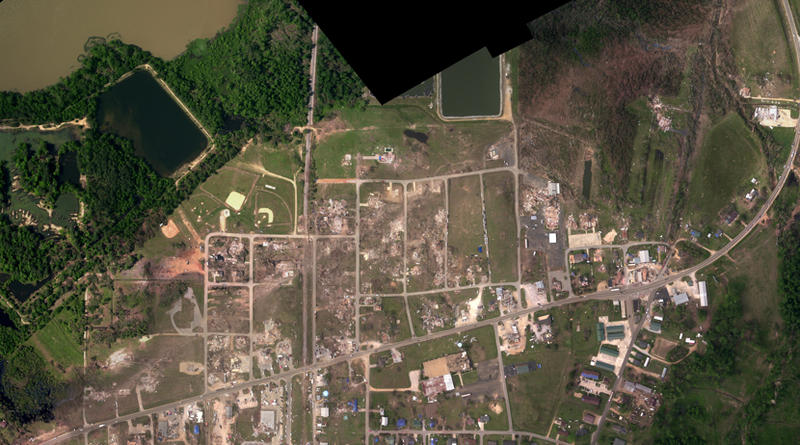 The home at bottom right was likely the one mentioned in the NWS survey as having been swept completely away near Holt Peterson Drive. 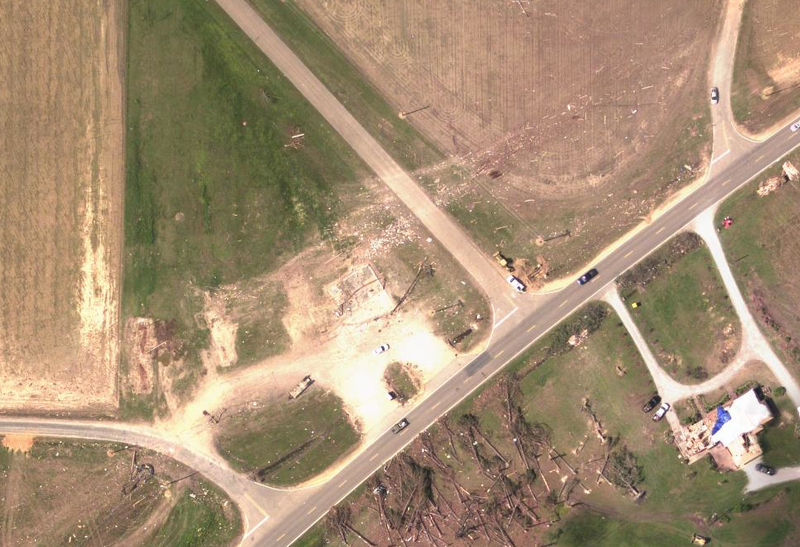 The house was obliterated in EF5 fashion, but tree damage nearby was not consistent with winds of EF5 intensity. The tornado was a mile wide as it passed through this area. 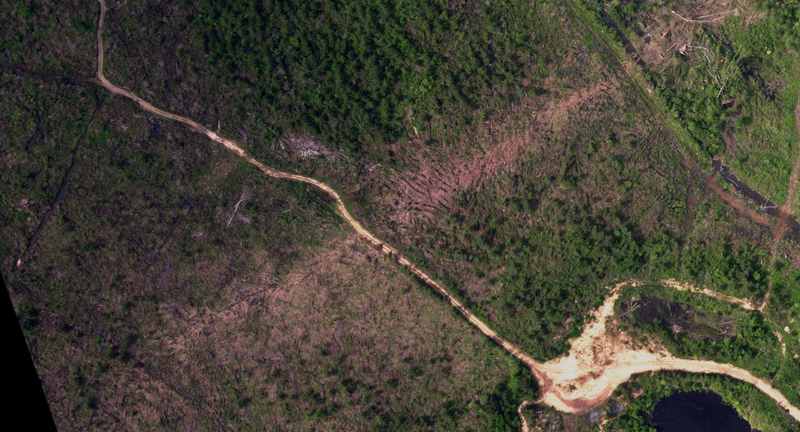 Due to the mountainous terrain, the damage pattern became complex and erratic. Less than a mile northeast of this area, the tornado destroyed a railroad bridge and hurled a 34 ton steel support-truss 100ft uphill. 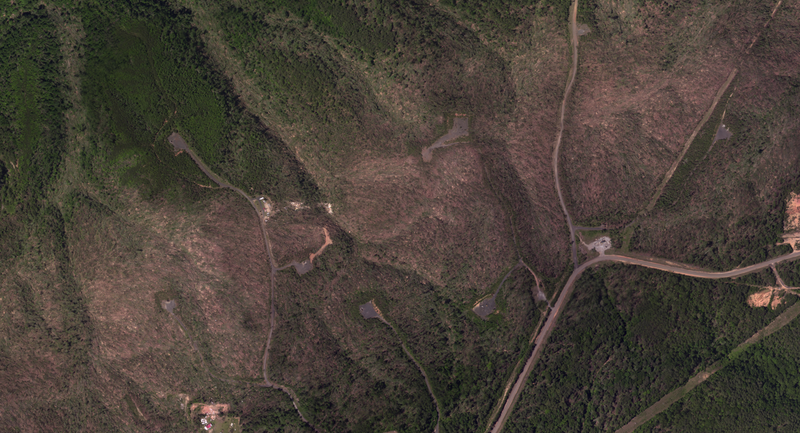 After exiting the Tuscaloosa metropolitan area, the tornado plowed through 35 miles of unpopulated forestland. 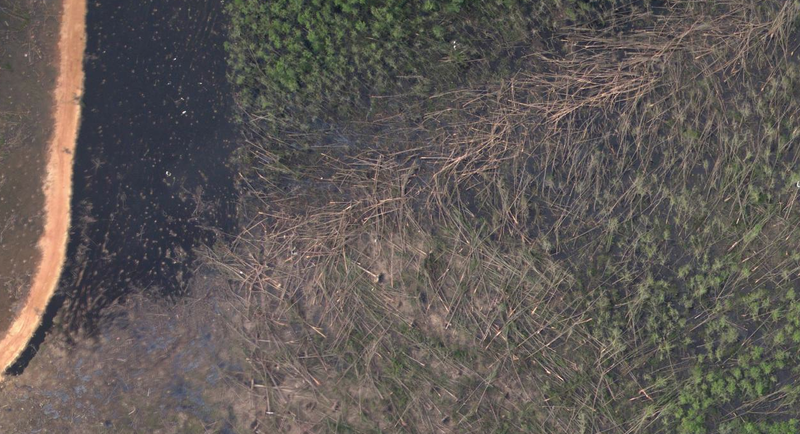 Aerial imagery of tree damage suggests that the tornado maintained EF4+ intensity and widened to over a mile in width. 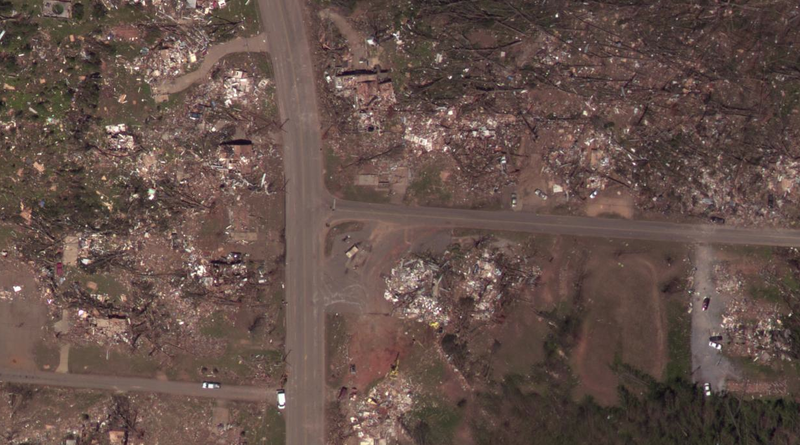 The tornado, along with several others in the 2011 Super Outbreak, left one of the largest swaths of violent tornado damage ever documented. 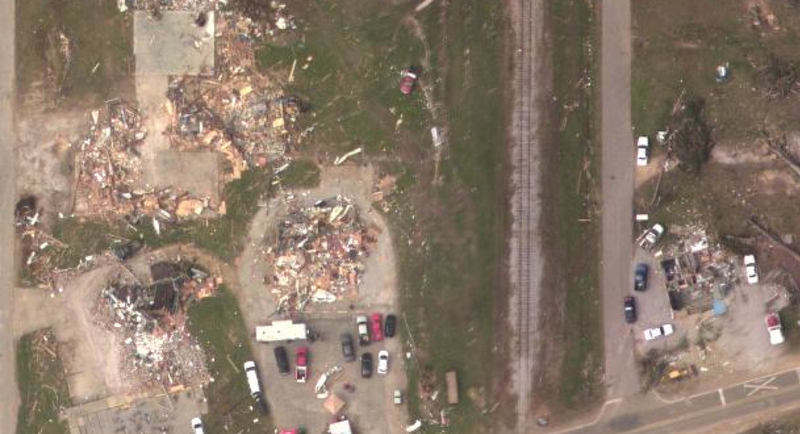 The tornado encountered a coalyard rail depot just southwest of Pleasant Grove, overturning all but two of the heavy cars. One car, which weighed 36 tons, was hurled 120 yards (visible at center). Eyewtiness statements suggest the car was thrown in one toss and not rolled (Knupp et al., 2012). This is the longest distance a railroad car has ever been moved by a tornado and possible evidence of EF5 winds. Damage in the suburbs of Birmingham also reached borderline EF5 intensity, particularly in a narrow swath of devastation through Concord. 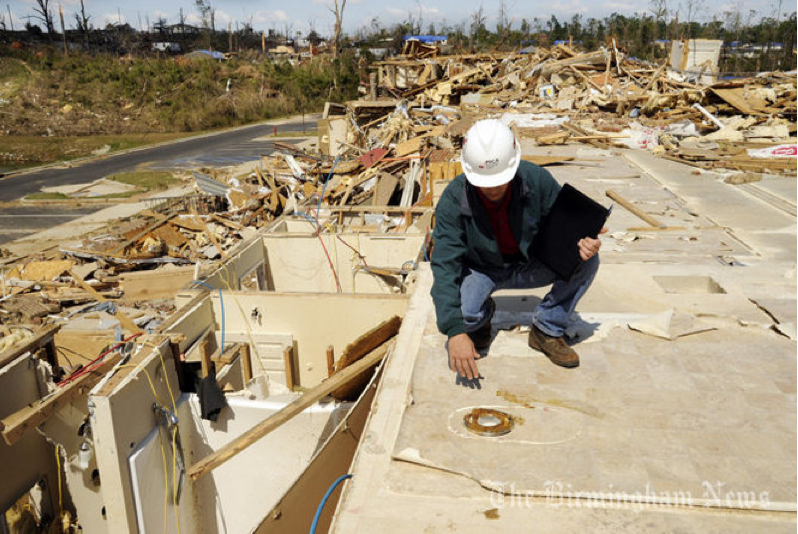 The Birmingham suburbs of Concord and Pleasant Grove both experienced borderline EF5 damage. Well-constructed homes were ripped from their foundations and large hardwood trees were almost completely debarked. 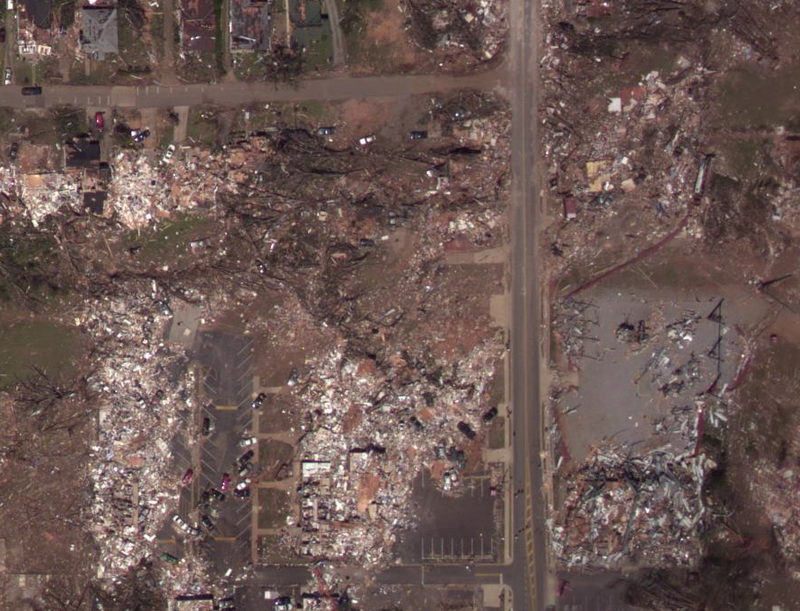 Had the Tuscaloosa tornado occurred back in the 90’s, it would have achieved an F5 rating. The EF-Scale, however, has stricter guidelines that differ from the Fujita Scale. People often erroneously believe EF5 tornadoes are weaker than F5 tornadoes since the former’s estimated wind range begins at 200mph and the latter commences at 261mph. The wind ranges are simply estimates and cannot be taken at face value. The EF-Scale was developed under the assumption that the Fujita Scale overestimated tornadic wind speeds. All things considered, the tornado likely falls in an unusual place – above the threshold of an F5 but just below the threshold of an EF5. 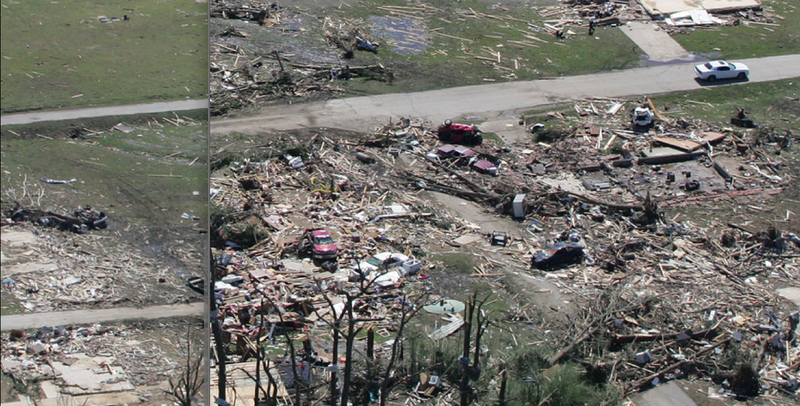 Damage in Alberta City, however, was more impressive than the worst damage caused by some official EF5s, such as the Greensburg, Kansas, tornado of 2007. 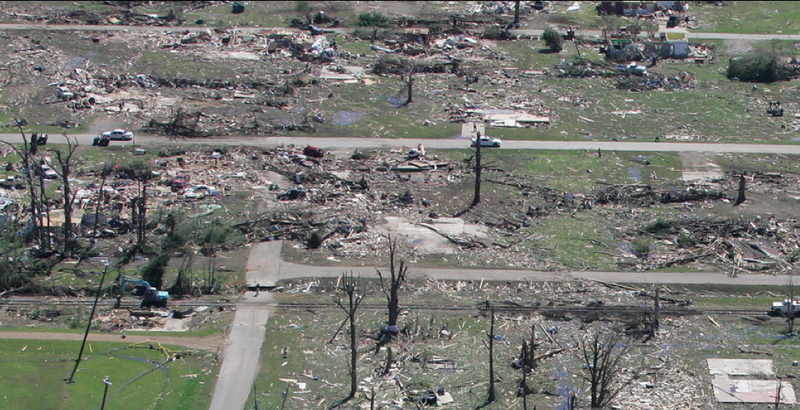 One inherent limitation with tornado damage scales is the lack of emphasis on wind duration – a variable which, with the addition of multiple vortices and transient wind features, is nearly impossible to calculate. 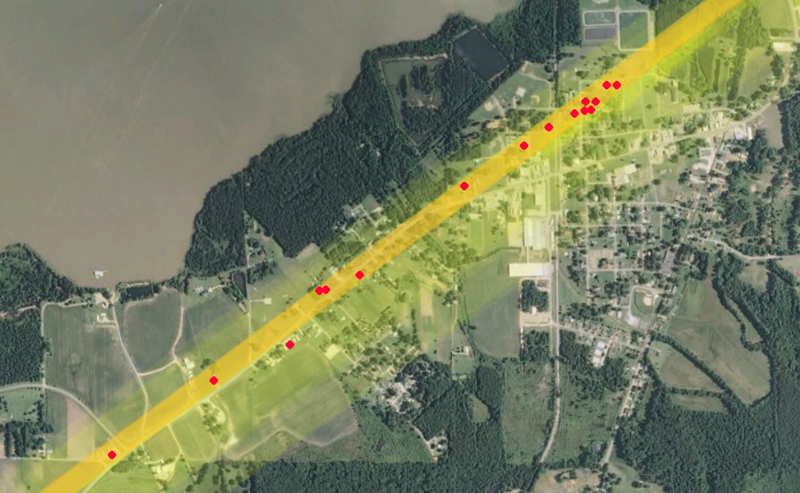 Considering the small size and fast movement of the Tuscaloosa tornado, it is quite likely the tornado had winds significantly higher than other large and more slow-moving EF5 tornadoes. 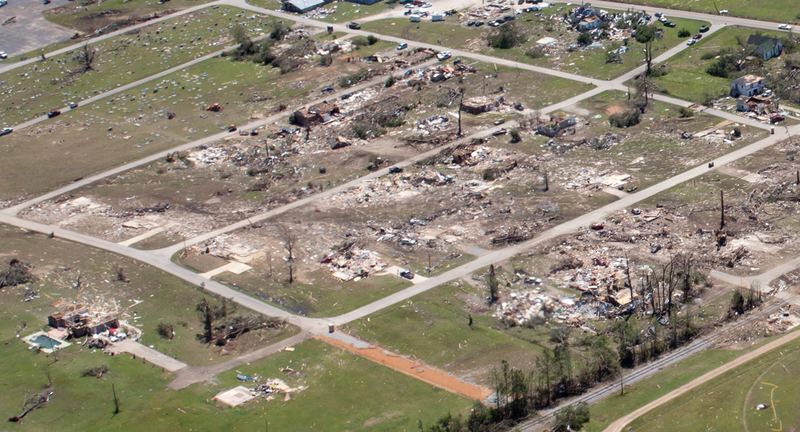 The four tornadoes that were awarded EF5 ratings during the 2011 Super Outbreak, however, were unusually powerful and caused noticeably more intense damage than the Tuscaloosa event, so an EF4 rating may have seemed most appropriate in context. Above is one of the few videos taken within close proximity of the tornado in Alberta City. The Chastain Manors Apartment Complex was located only a quarter mile south of the videographer’s home.